I've never been a big fan of pants in general or jeans specifically. I always found them uncomfortable and would wear denim skirts (still do) to get my denim fix. That's kind of funny because I live in, essentially, the home of denim, where a 100 year old partnership still lives on to produce American denim and some of the best selvedge around. But lately I've been embracing pants more - patterned especially - and finding I also really love the denim jean/heel contrast. But while I like wearing it more, I absolutely am not into spending a lot for it. Maybe it's my long-standing anathema or just the fact that I'm not tall and lanky, but I just can't bring myself to spend a lot, even if I like it. Sure maybe there are some magical technologies built into the fabric weave or the structure of the cut, but I probably won't ever find out. My range generally runs from JCrew at the top end to mostly Old Navy. Maybe I'll be won over some day by some vintage Japanese selvedge but I can't really ever picture me buying $1000+ jeans. However, I was nearly won over to the $200 camp by a pair of Mother Denim Crop Step Fray Jeans, especially when paired so perfectly by Emma Roberts. I really like this look. Lots of ankle. A classy heel. It's polished and casual and the lack of a full hem keeps it from looking too "done"
But then I thought, I can do that! 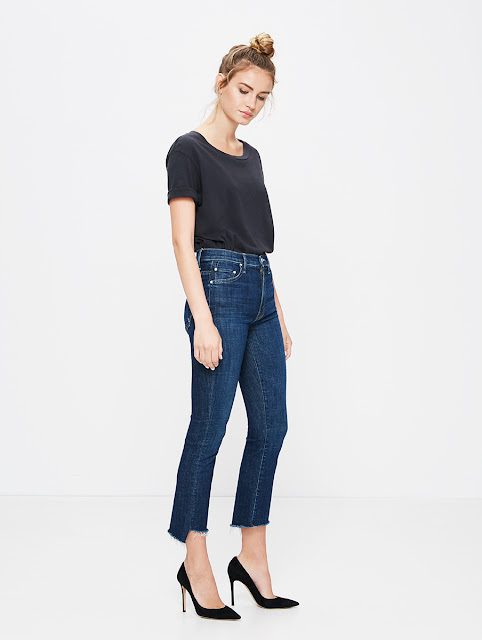 I mean, sure the main jeans need to be good too but I've been recently wearing a pair of straight legged jeans that I'd cropped and frayed myself, why not give this a shot too. So, I took advantage of the Old Navy Labor Day sale to stock up on a bunch of jeans I needed - from a pair for wearing outside with the animals, to new grey and mid-wash blue skinnies, to the pair to give the crop step fray action. I'll have to get a better shot but I like how the cropped but still longer back really frames up the shoes in the front. And at the end of the day, it really is all about showing off the shoes! really nice blog with stylish.